i am in the critical situation.our Mdeamon server SMTP service is going to stop/start without any specific reason. i need to received alert when it goes to stop. would you please help me to make a trigger query in solar winds? It could be possible to do this with NPM however Server & Application Monitor is far more suited to this task. On which platform is your mail application running? You will need SNMP enabled, you could also check vendor documentation to see if there is an OID available for monitoring the status of SMTP. i do not have any idea about how can i do that. The only option you have with NPM is to use the universal device poller. What mail system are you using? What platform is it running on? Have you added the node in NPM? If so what polling method are you using? WMI or SNMP? I would suggest downloading and installing an evaluation of Server & Application monitor, this is far more suited to your needs. i didn't get your meaning about polling method. actually i need to monitor Windows services,not server! When looking the node details page, what do you see under polling method? WMI or SNMP? Once you have the OID you want to monitor, use the universal device poller and assign it to the node. Agreed. 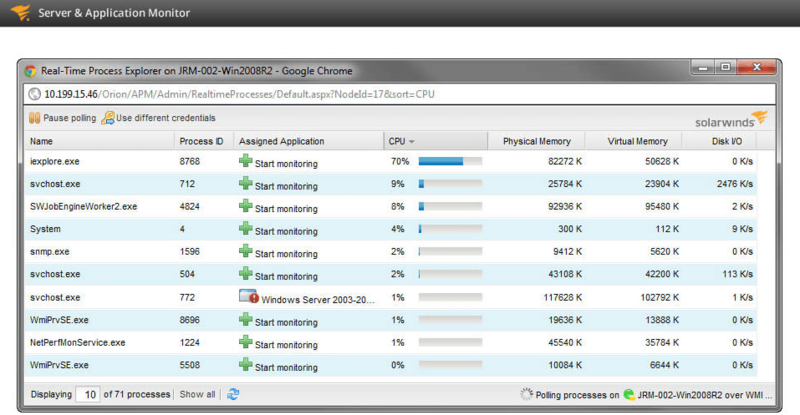 This is a very simple and straightforward task for Server & Application Monitor. Just point, click, and start monitoring.